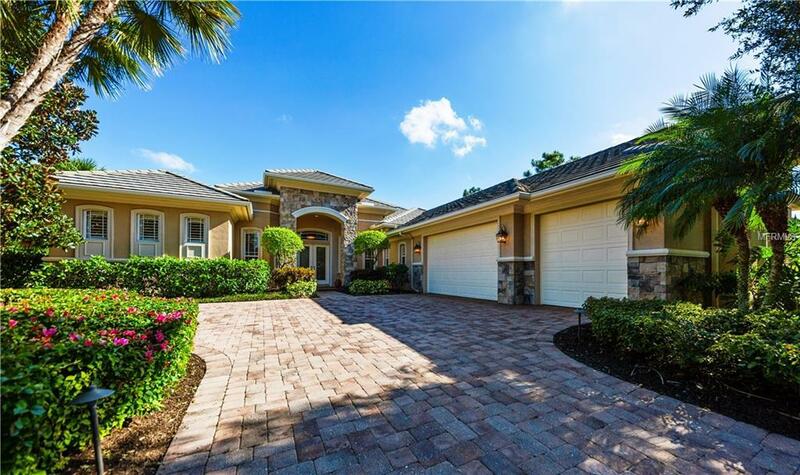 Live and play at the Founders Cluba Sarasota premier Golf Community. Beauty abounds as you enter this 4000+ square foot Armani custom built home by Taylor Woodrow. The entry view captures the magnificently designed formal living room; with views of the inviting pool and shimmering lake. Quality construction and attention to detail is evident from the intricate crown molding to the unique tile flooring used throughout the home. Custom plantation shutters adorned all the rooms. Floor to ceiling sliders are perfect for entertaining inside and out. Ergonomically designed kitchen, high end appliances and butler's pantry will please even the most finicky chef. The open kitchen to family room design is great for accommodating larger families. The owners suite features a sitting area, his and her closets with built in organizers, and a soaking tub. The bonus room or the 4th bedroom overlooks the picturesque lake. All bedrooms are ensuite. The den has been sound proof enhancedno echo sound in the background during your most important calls. When the sun sets the magic begins; custom enhanced interior lighting and exterior copper fixture lighting has made this home stunning. Relax by the pool, or stroll down the cobblestone path to the sitting area beside the lake. Enjoy the wildlife while listening to the sounds of nature. The Founders Club is an exclusive golfing community of only 262 resident sites. Golf membership to the Robert Trent Jones Jr. designed championship course is optional.